In 1920, the President of the Club, Judge Waldo, asked the Club take an active role either in the work of reforestation [after forest fires] or in the beautifying of the Arroyo Seco. The Club voted to ask the Park Commissioners to set aside an acre of land in the Arroyo to be known as the Pasadena Garden Club Acre, and to plant this land in native shrubs and flowers in whatever manner would be agreeable to the club. Little about Garden Club plans for the Arroyo is mentioned for nearly a decade. Funds for designing and constructing buildings in Depression-era Pasadena had dried up. Determined to employ as many workmen as possible, architect Myron Hunt and his wife, Virginia Pease Hunt, established Block-Aid in 1932 whereby a volunteer in each block of the city applied to neighbors for funds to employ out-of-work construction workers. At a Garden Club meeting on April 30, 1932, the Club reinstituted the idea of the wild flower sanctuary, citing the enthusiasm with which it had been received, and announced that a committee would be appointed to consider it. At a consequent Board meeting, the use of Block-Aid labor was recommended to clean up the Arroyo, without waiting for the decision regarding location of Sanctuary. Caroline S.G. Munro was named Chairman of the Wild Flower Sanctuary Committee. The sanctuary would be located probably in the Arroyo and t the work would be done by the Block Aid. Members were asked to increase their Block Aid donations, if possible, owing to the very serious conditions. A path was to be cleared from California Street to Colorado Street Bridge, work being done with Block-Aid funds. Decided to appropriate $100 of the Garden Club fund to buy plants for the sanctuary. On December 10, 1932, Mrs. Munro, President of the Club called a special meeting to order at the Athenaeum at Caltech. “A report was read by the President covering the work being done in the Arroyo Seco by the Garden Club. Special reference was made to the proposed house to be erected by the Club, in connection with the City Park Department and the Block-Aid for the relief of unemployment. On January 10, 1933, Mr. Myron Hunt, who had generously offered his services, presented and explained the plans for the building, answered questions and received suggestions. Mrs. Hunt thanked the Club for its substantial assistance to the Block-Aid work. The Pasadena Garden Club celebrated the opening of La Casita on April 28, 1933 with an orchid show held during the Convention of the California Federated Garden Clubs. The show was well patronized on both days. Afterward, the Pasadena Garden Club held a series of Sunday afternoon art exhibitions with hostesses serving tea to those who came. These exhibits featured the work of well-known California artists, particularly landscapes in oil and water colors. Today, the California Art Club, in conjunction with the La Casita Foundation holds a Paint-Out every 18 months to feature the works of local artists. In the decades following the creation of La Casita, the Pasadena Garden Club continued in its efforts to beautify the city. Their many efforts included projects at the Old Mill and the Huntington Botanical Gardens. This little meeting hall which for the previous 37 years had served its purpose as a community resource and garden center, was recommended to the Planning Commission as a Cultural Heritage Landmark by the Cultural Heritage Committee. “From the street, the visitor’s...view was a garbage dumpster...Beyond the dumpster stood an enormous dead oak tree...Festooned on [the] roof was a large air-conditioning unit and an upright conduit to which were attached...electrical wires leading in all directions. Moving around to the rear door of the building there were several more garbage cans...a railing of chain and galvanized posts, and an assemblage of meters, pipes, boxes, valves and other utilitarian elements that had encrusted the entire southern end. Looking back toward the street, one’s eye traveled over...asphalt [and] some patchy lawn.” (Greene, p. 4) “Thus ensued a long and lively relationship with the ladies of the Pasadena Garden Club. I had never seen anything like this group: bright, determined, and knowledgeable: so well-informed and so diplomatic that the project carried a momentum no matter what the obstacles that came before it.” (Greene, p. 6) No sooner were the plans approved, when in May 1985, an arson fire severely damaged the structure. The walls still stood, but the building was gutted. Sadly, Alson Clark’s painting was lost. While city officials expressed uncertainty about whether or not funds would be available to reconstruct La Casita after the fire, Tim Andersen, head of Pasadena’s Cultural Heritage Commission at the time said, “no matter what the extent of the damages turns out to be, La Casita will not be demolished.” Fire insurance paid for much of the restoration and donations came from community members. Mrs. John Barber who hosted the bazaar in 1933 to raise funds to build La Casita, sent a check for $5,000.00 to help rebuild it. It would take nearly $150,000.00 to repair the building that was built and furnished for $3,500.00. Momentum for the project continued due to the untiring effort of Lisa Clement. She convened the La Casita Restoration Committee, to oversee repairs in accordance with Secretary of the Interior Standards. The Committee included members of the Pasadena Garden Club, William Ellinger III, AIA, from the Planning Commission, and Peggy Stewart of both the Pasadena Garden Club and Cultural Heritage Commission. Local architect, Conrad Buff III, sat on the Committee and donated design services. By 1988, the newly designed garden was finished. Greene, along with Pasadena landscape architect Yosh Befu and contractor Julian Damas, collaborated to “create a garden in which the choice of plants reflected her long interest in California native species and those of other Mediterranean climates while the irrigation system demonstrated Befu’s expertise in the latest water-saving technology.” The goals of the garden inspired by the Garden Club and executed by Greene and Befu were to create an educational resource for the community which would demonstrate good garden design, sound horticultural practice, range of water use along with water-saving irrigation, to promote plants which survive in a Mediterranean climate and to increase community awareness and enjoyment of the Arroyo Seco. “A garden such as La Casita belongs to and is created by everybody. It lives, and fulfills, and creates a life far beyond the initial vision. Furthermore, it is necessarily managed by a series of people. As club members rotate in and out of offices and responsibilities they put their unique touch to it. Even the basic maintenance is done by [a] series of gardeners, each one with different abilities.” (Greene, p. 13) t the March 25, 1986 meeting of the Pasadena Garden Club ,there was a motion for creation of an endowment fund which would be set up as a public foundation., The La Casita Foundation was established by members of the Pasadena Garden Club in 1988 to maintain the gardens for public enjoyment. The Pasadena Garden Club maintained the gardens until 1994. But responsibility for them has been assumed since then by the Foundation with substantial funds and labor given by the Club, its members and community donors. In 1990, an application for support was made to the Founders Fund of the Garden Club of America to develop the education potential of the water conservation garden. The Pasadena Garden Club and La Casita were granted the title of Runner Up and an award of $5,000.00. On February 23, 1997 the gates for La Casita were dedicated in honor of Ruth Chandler Williamson and Martha March Chandler and their families. The gateposts were crafted by Robert Cook and the gates were fabricated based on designs by Isabelle Greene. They replaced galvanized posts and chains. In anticipation of the year 2000, the Garden Club of America encouraged all member clubs to plan a millennium project. La Casita Foundation and the Pasadena Garden Club created the butterfly sanctuary as the Garden Club’s effort. On April 28, 1999, it was dedicated to Mrs. Kingston “Veva” McKee, former Foundation and Garden Club president as a memorial to her love of nature and her vision for the garden at La Casita. The California Arts and Crafts Movement traces its roots along the banks of the Arroyo Seco back to the 1890’s. This natural landscape has inspired the works of Franz Bischoff, Jean Manheim, Edgar Payne, and Hanson Puthuff among many others. In 2000, the Pasadena Garden Club sponsored “Vistas of Historic La Casita and the Arroyo” which was a one-day opportunity at La Casita for artists of the California Art Club to display and sell their work to the public who had paid a small admission price to view it. Through the continued leadership of Elaine and Peter Adams of the California Art Club and the support of La Casita Foundation, in 2007 and 2008, artists such as Peter Adams, Tim Solliday, William Stout and others have come to spend a week to “Paint Out” in the Arroyo. At the end of the week, they are invited to sell their work at La Casita for their own benefit and in support of the California Art Club and La Casita Foundation. The affiliation has been profitable for all. It is worth recollecting that the first art exhibitions at La Casita were held upon its opening in 1933. 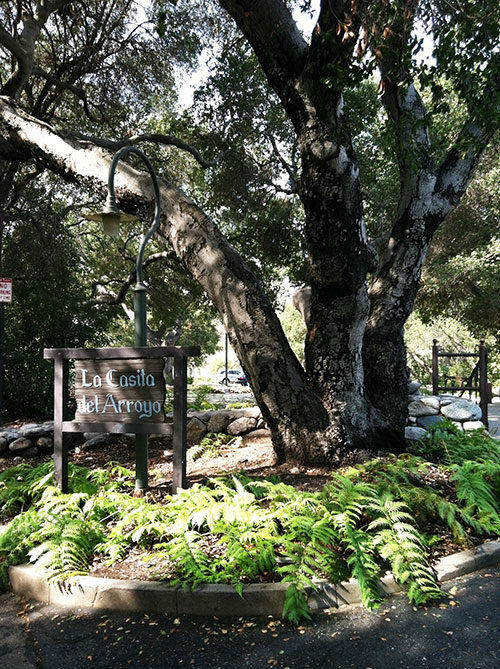 In April of 2008, the nomination of the central and lower Arroyo Seco in which La Casita is situated, by Pasadena Heritage to the National Register of Historic Places was approved by the State Historical Resources Commission. In 2014, a much-needed renovation was completed and included a new roof, flooring, kitchen, bathroom and fireplace gas logs. The renovation was made possible with funds from the City of Pasadena and La Casita Foundation. La Casita was named by the Garden Club of America at their Centennial, as one of the five most important Community projects in the nation, and as a model for private-public cooperative projects. The Foundation, along with the Pasadena Garden Club, continues to improve our relations with our City partners and to continually perfect this unusual private-public partnership that has held La Casita del Arroyo in good stead. We continue to make improvements to the gardens as needed and rely on our Community support to maintain the gardens at La Casita for the public to enjoy.